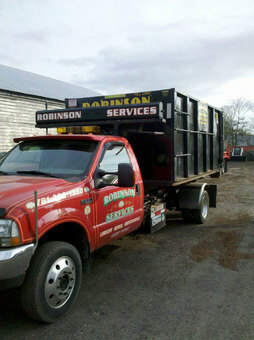 Robinson Removal Services specializes in rubbish removal services throughout Malden, MA. We offer friendly customer service and strong communication on what needs to be removed. During the removal process, being most equipped with the proper dump trucks and equipment is important. We also provide dumpsters and roll off containers/bins for you convenience contact us for more information. Removal of all Junk, Metal, unwanted old Furniture and Appliances ( Stoves, Ovens, Refrigerators, Washers and Dryers ) from all Apartments, Houses, Attics, Basements, Cellars, Garages, Storage units and pods, Swimming pool demolition. Complete and final cleaning of all finished and unfinished Construction Sites and Projects. Complete removal of all Construction Debris, Wood, Tile, Sheetrock, Brick, Concrete, and Metal. We also Demo and remove all Boilers, Hot Water Heaters and Tanks and Furnaces. complete demo of all outside wooden and metal Sheds, Fences and Pools.